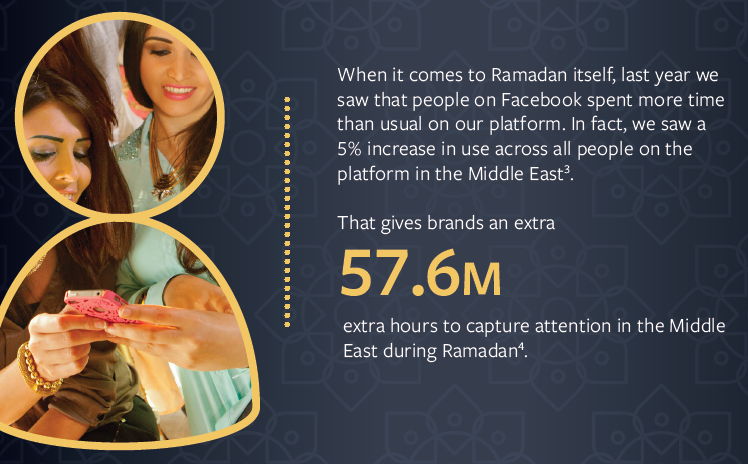 Facebook is going all out to remind marketers the role that the social media platform plays when it comes to connecting with consumers during Ramadan in the Middle East & North Africa (MENA) region. The playbook that it has put together for marketers and agencies to help in formulating their strategies once again advocates mobile technology as an effective means to communicate. Last year, it was discovered that conversations around Ramadan are growing. In comparison to 2016’s seven-week discussion period, conversations about Ramadan started early this year and are expected to last for nine weeks on Facebook, among UAE’s 8.4 million monthly active users. This trend continues to grow and can be split into three distinct phases. Discovery and Inspiration: The first phase, typically marked for four weeks pre-Ramadan is all about discovery. This is hugely important in a world where people are spending more time on mobile apps than browsers. Fashion is one area where people start planning early. Around 47 percent of people surveyed in the UAE begin planning their clothing purchases in the month before Ramadan. Clothing purchases are 1.63 times more likely to be planned than impulse buys. When it comes to Ramadan, Instagram is a place of imagination, artistry and creative power. 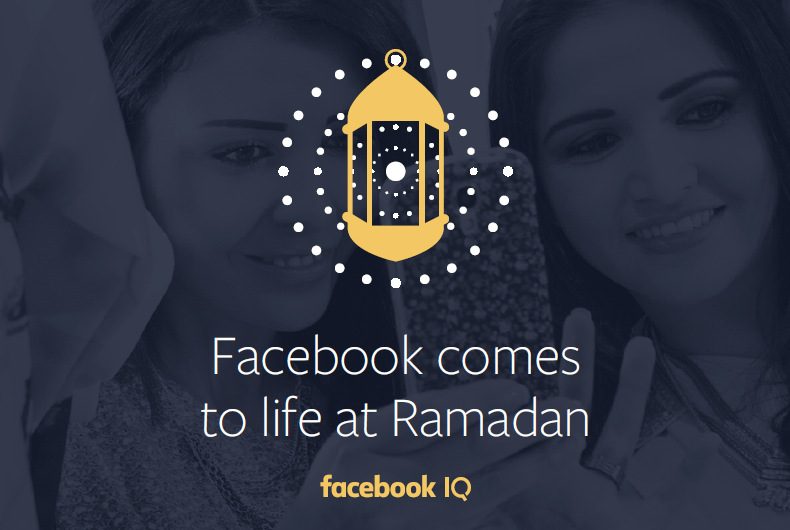 Where Facebook is often about the more practical aspects of Ramadan – advice, offers, conversation – Instagram is where Ramadan fashion and gifting is put on display. According to Facebook, people talk about fashion seven times more on Instagram than on Facebook. 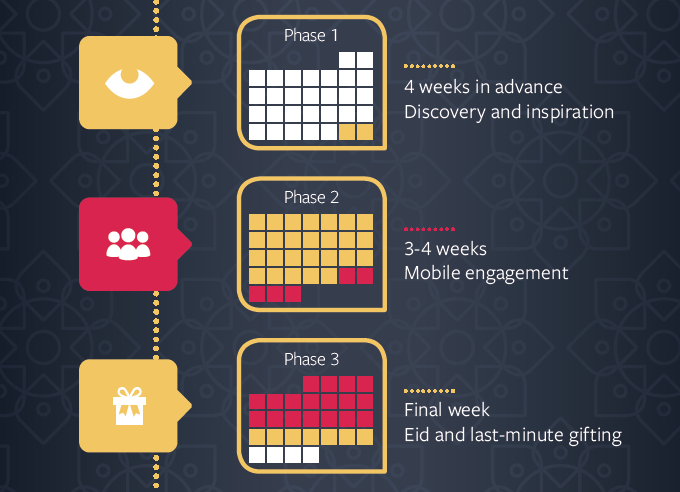 Mobile and Visual: The second phase, which is essentially the three to four weeks of Ramadan, is about connecting via mobile and visual. During Ramadan, people are most often to be found on their smartphone, posting and sharing images and videos. Ramadan is a mobile-first month in the UAE, especially for young people, with people sharing Ramadan experiences via mobile, images and video. Over 4.84 times more mobile conversations take place during Ramadan compared to non-Ramadan months in the MENA region. Moreover, watching television is among the most popular pastimes during Ramadan, as families gather together to watch specially commissioned shows. But the TV is no longer the only screen in today’s living room. Around 71 percent of Facebook users in the UAE say they’re on Facebook while watching TV, with that number rising to 77 percent for Instagram. Shopping Decisions For Eid: The final phase, lasting about a week, is all about last minute opportunities at Eid. People are looking for gifting and travel opportunities. Around 70 percent of people in the UAE say they rely on Facebook for gift ideas. Although shopping continues to happen throughout the day, around 3 am seems to be the time where usage peaks on Facebook during Ramadan and the optimal time for advertisers to gain the consumer’s attention. Moreover, travel is an essential ingredient for millions during Ramadan. Whether it’s taking advantage of the long weekend at Eid, there are over 20 million interactions with content related to either going on or planning a journey in the UAE and KSA take place on Facebook. Planning travel tends to take place from the months of August-September. #1. Facebook – Where Decisions Are Made: Whether it’s travel transactions and late night shopping or discussing the challenges of Ramadan fasting and health and fitness, Facebook is where people come to make decisions or seek advice. #2. Inspire On Instagram: Compared to Facebook, Instagram sees a higher concentration of conversations around Iftar, desserts and recipe ideas, as well as fashion, cars and home. While Facebook shows Ramadan as it is, Instagram shows the Ramadan that could be. #3. Trailer Your TV Show On Facebook: With over 100 million hours of video watched every day, Facebook has become a powerful mobile video platform. Facebook research shows that video ads on Facebook act as a ‘trailer’ for TV, increasing brand metrics like recall and awareness. With conversations about Ramadan TV beginning at the end of April, it’s crucial that broadcasters tap into this audience to trailer their TV premieres. #4. Tell Stories With Instagram: More than 150 million Instagrammers use Instagram Stories daily. And people are highly engaged with businesses. In fact, one-third of the most viewed stories are from businesses. #5. Make It Meaningful: In a mobile world, there are more opportunities than ever to reach people. But there has never been more competition for attention. Relevance is key when it comes to cutting through the noise. That means taking advantage of Facebook’s people-based targeting tools, as well as developing creative that reflects people’s real interests. Facebook recommends beginning with audience insights to find out more about who customers really are. #6. People Love Local: When it comes to buying food or clothes, most people have a limit on how far they’ll travel to a store. Facebook’s Local Awareness ads allows businesses to target people within a certain radius of their store. #7. Don’t Just Go Big – Go Global: Just a few years ago, most businesses were limited to serving customers on the same street, neighborhood or region. But with over one billion people on Facebook connected to a business in another country, it’s now possible for any business to reach people in a new country.